We’d love your help. Let us know what’s wrong with this preview of The Right-Hand Man by K.M. Peyton. It's 1818, and reckless Ned Rowlands is the fastest stagecoach driver for miles around. Ned attracts the attention of the young Lord Ironminster - determined to win a racing wager against his wealthy cousins, the Savilles, and desperate for Ned's help. Ned is quickly drawn into a strange partnership with Ironminster; as his new friend's right hand man, Ned has an important role to play in helping him outwit the Savilles and preventing his title and estate from passing to them. To ask other readers questions about The Right-Hand Man, please sign up. My favourite book as a teenager by my favourite writer at the time, this book is as fabulous now as it was then (and I'm just as much in love with Ned Rowland as I ever was!) If you love Regency drama, a bit of romance, a bit of crime and some rather fabulous horses as well as flawed but loveable hero and a bit of genuine 'bromance' this is worth the read. Wonderful Victor Ambrus illustrations as well. I thoroughly enjoyed this. 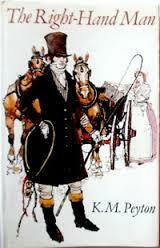 I have enjoyed K M Peyton’s books since I was a young teen but had never read this one. I wasn’t that keen on reading it after reading the description as I am not that fond of historical novels. But quickly got into it and found it enthralling.